Organic Sales: Overall store sales are 73% organic. Produce sales are 100 % organic, including local. Mile High researches every new product to ensure that it is GMO-free. All items that are not certified organic are verified GMO-free, ingredient by ingredient. Manufacturers are required to provide written verification that product ingredients are GMO-free. Most locally sourced products are certified organic, but in cases where they are not, the online grocer screens the ingredients for GMOs. Mile High also screens product packaging and, in the case of compostable food containers, requires them to be GMO-free. About 75 new products per week are being added to inventory. That number would be higher, if there were more GMO-free suppliers and products available. 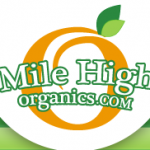 Mile High Organics reviews products on a regular basis. They have and will continue to replace products with brands that better meet their standards. Ingredient reformulations are the most common reason products are removed. Organic products are labeled on the Mile High Organics order page.